There really isn't much to the recipe because it's exactly as the title states. It's straightforward and any hot dog, cheese and bacon loving individual can appreciate this. But what's not reflected in the above picture is the accompaniment of cottage cheese and tomatoes. The Baron is a big fan of cottage cheese and tomatoes... while I am not. However, for those that do enjoy the combo, the Baron highly recommends pairing these fantastic hot dogs with them. Oh, and according to him, the proper meal must also incorporate potatoes, hence the golden tater tots you see above. In a medium saucepan filled with water, boil the hot dogs as directed on the package. When cool enough to handle, cut each hot dog lengthwise to open up, but do not cut all the way through. Cut the American cheese in half and place inside the hot dog to cover. If using shredded cheese, place as much as desired to fill. Top the cheese layer with the cooked sliced bacon. Bake stuffed hot dogs in preheated oven for 5-7 minutes or until cheese has melted. Remove and serve hot with tater tots, cottage cheese and sliced tomatoes. Simple and cute recipe!!! Looks delicious!! A simple recipe, looks good. I have a few peeps that are obsessed with hot dogs and bacon. This is perfect for them! Yum! 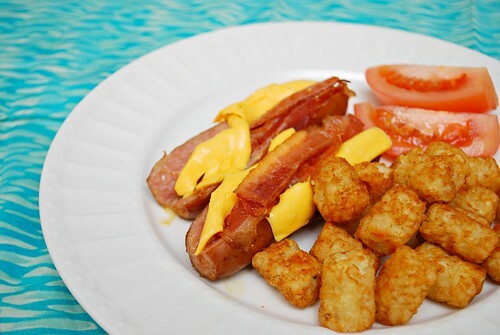 See a traditional Philadelphia food called a "Texas Tommy"; Split hotdogs filled with cheese and wrapped with bacon. Many of us ate these at our parents' table in the 1950's and earlier!